I write to inform you that on Thursday 21st April we successfully completed the removal of the original steel/slings/ratchet straps/ keel blocks that were supporting Mossdale, thereby transferring all loads onto the new cradle. This was effected with no damage to Mossdale and, indeed, with barely any movement of her old timbers. This highly satisfactory outcome is due in no small part to user-friendliness of Fenton Holloway’s design and the sensitivity displayed by R&R Engineering during the installation process. I would like to record my appreciation to both organisations for ensuring that a potentially fraught operation was able to run so smoothly. The above noted company has worked for us on a number of high profile refurbishments of historic structures and mechanical repairs/maintenance of water control facilities over the last 17 years. The work has always been carried out with complete professionalism, expertise and minimum of delays, the staff employed are extremely well qualified and knowledgeable in many aspects of challenging fabrication and mechanical contracts with a large variety of old and modern metals. They have worked as main contractor, on the Anderton Boat Lift, Hayhurst Swing Bridge, Vale Royal Sluices, the restoration of an historic boat and refurbishment of historic dry dock facilities, as well as Sub Contractor on Pontcysyllte Aqueduct a world heritage site. The quality of work is always excellent and of a high standard and their dedication to problem solving without cost increases has made them a first choice for us whenever we need help. Just a quick note to thank you for your efforts on the galv plate works, Tim and myself are really impressed with your approach from design through to install. Please pass on our thanks to the install team they were superb. Look forward to the next R&R works on the 3B roof. 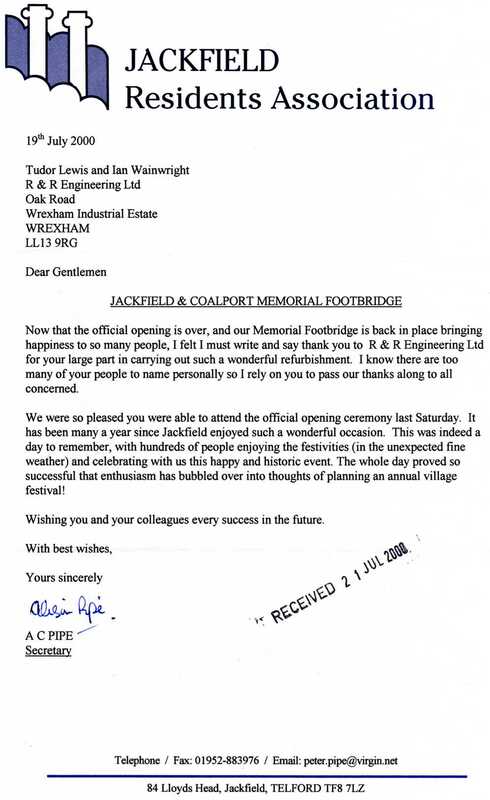 Practical Completion was achieved for Site 10, Paradise Street on Friday 30th March 2007. I would like to take this opportunity to thank you for the time, assistance and sometimes heartache you have put into the project. We will be organising a celebration of PC in the near future and I look forward to seeing you there and working together again in the future. Once again thank you for your efforts. I would very much like to pass on my thanks and say what a great job Phil and the R&R team have done sorting out the Gas regulator issue this week. Great support and teamwork by all involved.